US President Donald Trump has is not thrilled about Kurds Syrian allies YPG after it transpired that the militia group has been selling oil U.S. Middle East rival Iran which has been under US sanctions. “The Kurds, our partners, are selling oil to Iran. We are not thrilled about that. I’m not happy about it at all,” Trump told reporters on Wednesday. “We want to protect the Kurds, nevertheless, we want to protect the Kurds but I don’t want to be in Syria forever,” Trump added. 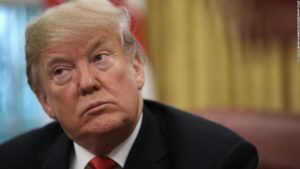 President Trump last month announced the withdrawal of US troops in Syria leading international forces fighting the Islamic State group (ISIS). The U.S had been supporting the YPG believed by Turkey as an affiliate of the PKK group that has been waging insurgency in Turkey for over 30 years. Ankara, Washington and the UE have place the group on their terror lists. Turkish authorities have repeatedly urged Washington to drop support for the Syrian Kurds and has building up forces near the border with Syria for an assault on the US ally. Washington in November prohibited all its allies to deal with Iran with new set of sanctions targeting the oil of the Islamic Republic. Trump in May tore the 2015 nuclear deal between Iran and world powers and in August renewed sanctions against Tehran. Posted by KanelkaTagba on Jan 3 2019. Filed under Uncategorized. You can follow any responses to this entry through the RSS 2.0. Both comments and pings are currently closed.